Two physicians unveil a revolutionary, accessible, science-based, patient-centered program for living an active, age-defying, disease-free life. Healthcare is pulled and shaped by many forces, by drug and insurance companies looking for profits, by politicians in search of votes, and by stressed, overworked physicians who barely have time to talk to you before writing a prescription or packing you off to a specialist. So is anyone interested in keeping you well? Yes. Created by two physicians who both survived catastrophic illness, the Ultraprevention program will work for absolutely everyone -- old, young, healthy, sick, or somewhere in between. The promise of its practice is huge -- a health span that matches life span -- and you'll experience increased energy, weight loss, enhanced mood and memory, better digestion, deeper sleep, diminished stress, and more. Ultraprevention is the new science of staying healthy, an innovative program that shatters the myths of today's "fix-the-broken-parts" medicine. These myths -- drugs cure disease, genes determine your fate, getting older means aging, fat is a four-letter word -- are actually believed by many doctors and are keeping you sick. Ardent general practitioners, Drs. Hyman and Liponis reject the current healthcare system of specialists paid to find something wrong, specialists who don't consider how their "cure" for one ailment affects the entire body. Working outside the managed care model at Canyon Ranch in the Berkshires, Hyman and Liponis break free of the vicious quick-fix prescription cycle and formulate a program that identifies and eliminates the cause of disease instead of just masking symptoms. Isolating the source of more than 90 percent of today's most common diseases, from cancer and heart disease to diabetes, stroke, and Alzheimer's, they enumerate the Five Forces of Illness -- Sludge (malnutrition), Burnout (impaired metabolism), Heat (inflammation), Waste (impaired detoxification), and Rust (oxidative stress). Through the practice of the six-week Ultraprevention program, you'll learn three simple steps -- each only two weeks long -- that stop these forces and create a lifetime of good health by removing allergens, infections, and toxins from the body and environment; repairing the body through personalizing nutrition, boosting the immune system, and balancing hormones; and recharging with stress management, sleep restoration, and gentle movement. So stop falling for the myths that make you sick and start Ultraprevention, the powerful plan to get older without aging, to maintain health for all of life. Best book to read for staying healthy! Every congress person and the president should read this book if we are to change our health care system. Western medicine treats the human body only as parts (like a car) not as parts belonging to our body as a whole. Our digestive system is the engine which nourishes our whole body, including our brain. The FDA has been infiltrated by the food and drug industry and therefore permitted the addition of too much sugar in just about every thing we buy. Sugar is as adictive as cigarettes. The food pyramid is based on grains all loaded with sugar and corn syrup, which plays havoc with our insulin levels. Try finding breads or cereals without added sugars. We have an epidemic of diabetes. If we are to fix our health care system we need to approach it as Dr Hyman does. Most doctors are not trained in nutrition, this book will help all of us to understand and listen to our body in a constructive healing way. A must read if you want to get off expensive pills and live happily ever after. Lots of sensible if familiar advice--eliminate sugar, white flour, processed foods, saturated fats. At times a bit extreme--install a reverse osmosis water filter, keep pets out of the bedroom, take your shoes off before tracking lead into the living room, be suspicious of the mercury all around you, be careful of all the toxins on golf courses. So... you want to be well??? If you believe that medicines cure people, don't waste you time or money with this book. If you know better, and realize that what you put into your body or withhold from your body is more likely the cause of health or illness, then this book is for you!!! Now, don't let THIS statement scare you: you'll learn about your body from the cellular level and up. HOWEVER-- it's neither written over anyone's head, nor is it too simplistic as to lose your interest! It gives you the "whys" and the "hows" of making healthy decisions, and you'll not regret making them. The plan is easy to understand, and easy to apply-- definately "do-able" as a LIFEstyle. This is truly a great book that I think just about everybody should read. However, like another review said, it's nothing new. The advice for healthy living has been around for decades in the natural healing (read books by Norman Walker, Dr. Richard Schulze, Bernard Jensen) community and probably for thousands of years for practitioners of Traditional Chinese Medicine. It's funny how the medical community acts as if nothing is real until a doctor or scientist claims to have discovered it. Which leads me to my number one criticism of this book (which you could argue is not really a fault of the book at all). What in the world do they teach people in med school? I'm dumbfounded by how completely clueless some of the doctors are in the anecdotal stories in the book. Don't get me wrong, for trauma surgery and other such emergencies the modern medical profession is truly amazing. However, for degenerative disease they are worse than useless. The book states that the 3rd leading cause of death in the US is medical treatment. I would also say this is a little unfair to the medical profession because most people who get to the point of needing such treatment have already dug 90% of their own grave through poor lifestyle choices. Having said all that, I think this is a great book because it describes in detail what's wrong with the current mostly drug based approach to treating disease and also tells you what to do about it. It also has a message of recommending that YOU take responsibility for your own health instead of just handing all your power over to your doctor, preacher, favorite health guru, etc. and expecting to magically get well. The authors of this book are doing a great thing with their practice and also by spreading the word about healthy living and for this I am grateful. I'll probably even buy a couple more copies of this book to give as gifts to people I know who need it. This book could also save your life IF YOU READ IT. THIS BOOK COULD SAVE YOUR LIFE!! 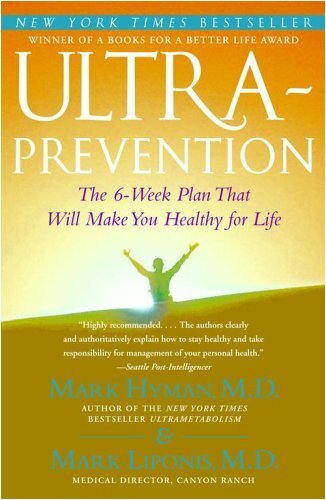 If you'd like to get off your prescription medications, break free from fatigue, and experience true wellness, read Ultraprevention... then follow the six-week path to good health. Full of stories about real people, the book is interesting and engaging... an easy weekend read. Authors Hyman and Liponis are both U.S.-trained physicians who write frankly about the strengths and weaknesses of our "health care" system. One is a cancer survivor, cured by the drugs and surgery of Western medicine, who was left wondering how he could ever have gotten so sick in the first place. The other had a knee that was deemed unfixable by Western medicine, but he found a cure through Chinese remedies. Both came out of their experiences determined to find a better approach for their patients. This book will save your life! Agreed...A fine book, but Nothing new! First, I must in large measure agree with Justus Pendelton's "All good stuff but nothing new". Having read the book and watched an interview of Dr. Liponis on TV ;-), I find his approach utilizing an integrated holistic approach to health refreshing. 2) My other comment, which is not really one about the book!, is about the myriad reviewers who rate this book based on whether it conflicts, reinforces and validates their own previously held convictions! Unfortunately the book is not rated on whether it provides new insight or grounds for expansive thought or even if it challenges previous popularly accepted notions. And with all due respect, such a review review is of little value, as it provides no insight into the book itself. And to amplify this a bit, if the book simply validates one's previously held opinions, but adds little additional insight or practical application, the book indeed offers "good stuff but nothing new". And this in itself is NOT a reason to add this book to one's bookshelf, as it contributes little substance to the discussion at hand. Rather, it constitutes a review akin to one saying their blind date was "nice" or has a "nice personality"! While not a denouncement, neither is it a hearty endorsement! I give this book a low rating not because anything in it is bad per se, only that there is nothing all that great in it either. It is broken into three sections. The first two basically discuss their theory of disease along with anecdotes from their practice. While all of this is certainly interesting you're probably reading this book for its practical application to your life. So a story about someone's drug interaction and how the doctor's diagnosed it isn't particularly relevant unless you happen to have the same weird biochemistry that that patient had. One, in the previous two sections they mentioned numerous medical tests (e.g. checking homocystein levels or measuring metabolic performance) as being useful for diagnosing your overall health. Yet in this section there is no mention of these tests. Which ones should I ask my doctor to perform? How often should I have them performed? Two, and this is the killer, nothing they have to say is new or different. Almost the same exact advice regarding diet and exercise is contained in my 10 year old copy of a book by the guy who did Abs of Steel. If you haven't paid *ANY* attention to health and diet literature over the past decade then what they have to say might be new to you and so the book is useful for that. But at this point you can pick up most diet and nutrition books that aren't focused on a single fad diet and they'll contain the same advice: exercise (both aerobic and resistance) regularly, watch out for foods with a high glycemic index, cut out sugars, caffeine, and alcohol, minimize your animal and large fish protein and fat consumption, avoid overly processed foods, eat lots of colorful vegetables high in antioxidants, get plenty of sleep, lower your stress, laugh, enjoy life. Yes, their plan will make you healthier if you can follow it. But their plan isn't any different from what most health books have been suggesting for at least a decade and most people haven't been following their advice. I found this book to be extremely helpful. It outlines health issues in a very easy to understand way and gives great tips on tests you can ask for when you visit your doctor that will help you determine how to manage your long term health. The author makes a great case for preventing disease rather than dealing with it in crisis mode. He does a very through job explaining how all you body systems need to work together to create a healty life. This book is a mixed bag. On the good side the early pages were excellent and informative. The first chapter is a health myth test. There was a lot I didn't know and I was drawn in. Then the first half goes into the health care myths and why they aren't true. Informative stuff. And it is the first book I have seen to dispense with the illusion that your doctor and health care provider are going to look out for you -- and be blunt about it. But the second half got lazy. The authors started contradicting themselves; ie. don't diet you will lose muscle mass; but then saying a few chapters later to eat less as many studies had concluded that eating less was healthy for you. They say eat less in one sentence and then spend chapters telling you to eat more. Eat more veggies; fruit; more fish; more nuts. They keep telling you that mainstream doctors won't listen and that mainstream doctors won't run unnecessary tests. Then they ask you to go get unnecessary (to many doctors) tests. Um right. How can I get the tests they want me to get if I have to go to my doctor to get them? So the entire basis of this book relies on a doctor being willing (and my insurance being willing) to pay for the tests that they admit doctors don't see value in at this time. They keep referring to what they do at Canyon Ranch -- well sorry we can't all be your patients. Then they keep telling you about things that are bad for you, such as mercury poisoning, but not telling you in detail how to cure it or treat it. Well isn't that why I bought the book? The final chapters are an ill-organized mess of saying the same thing over and over and over until you can't tell why you are doing what. I am pretty sure that *throw in everything but the kitchen sink* was what they were aiming for. So, I am glad I purchased the book because it does have some good things in there that I didn't hear before (did you know that eating slow helps heal your stomach lining? ), but I will have to go through it at few times and cut it down to the things that are most important in my life and that I can reasonably do. This book could also kill you.